Arunachal Pradesh Public Service Commission (APPSC) has issued the recruitment notification for 667 Trained Graduate Teacher (TGT) and Post Graduate Teacher (PGT) posts. Aspirants waiting for APPSC TGT/PGT Notification 2018 can proceed to apply for the announced posts. The application process ends on 9th July 2018. Hence aspirants with suitable educational qualification can apply for the announced posts through APPSC official portal, appsc.gov.in. The online application process has already started and the APPSC TGT/PGT Application form 2018 is presently accessible on APPSC website. 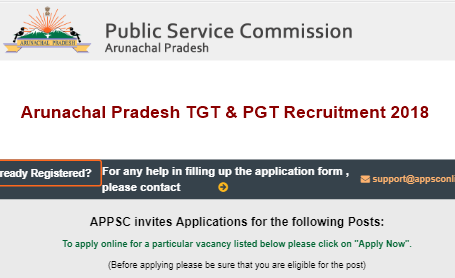 Candidates seeking to apply for APPSC TGT, PGT posts can check the further information like eligibility criteria, application process, selection process and other details from the following article. Arunachal Pradesh Public Service Commission is the state level organization that announces various job opportunities for the suitable personnel every year. The Arunachal Pradesh PSC has recently issued the recruitment notification for 667 teacher posts. Interested and eligible candidates can apply for the announced posts before 9th July @ appsc.gov.in. Candidates can download APPSC TGT PGT notification 2018 and observe the complete details from it before applying for the announced posts. Aspirants must have atleast 2nd Class Master’s Degree in relevant discipline from any institute/ university which holds the Government recognition, along with B.Ed. Candidates must have atleast 2nd Class Bachelor’s Degree in Science/ Arts/ Commerce from any Government approved university with B.Ed. For TGT: applicants should not be less than 18 years and not more than 33-years of age as on 9th July 2018. Click on the official notification and find the details from it. Check the details from the official notification such as eligibility criteria, application process, application fee, and other details clearly. After that, aspirants can fill up the online application form for TGT/PGT posts. Fill up the application form with all accurate information and attach the scanned copies of required documents to it. Also, attach the signature, and scanned photograph as well. Once check all the details after filling up the form and click on submit button.